“Co” in Polish means “what”. Subsidiary of Australian exploration company raised hopes of many inhabitants of Lublin voivodeship (one of the least developed with large unemployment) for economic boom in the region, comparable to the one that many years ago happened in Silesia. The same people, asked today about PD Co would raise eyebrows: “PD what?”. The enthusiasm started to rise around summer 2013, when PD Co reached very promising coal deposit (so far the company was drilling without looking for publicity and the managers were sparing with words). The local authorities were rubbing their hands that soon the poor region might become the industrial basin, concentrated around hard coal mining (at the same time Kompania Węglowa announced, that they are also considering setting some new operations in LZW). Cyców commune was expecting 5 million income from taxes paid only by LW Bogdanka. Adding to that another mine surely captured their imagination of becoming one of the richest communes in Poland (for years now on the top of that list is Kleszczów with brown coal mine owned by PGE; Puchaczów, where LWB is based is 5th on that list). Meanwhile, PD Co decided that the PR and marketing wheels should start turning. More and more articles appeared about promising project in Lublin area and the company was taking sponsorship of some industry events. Also, PD Co’s CEO Janusz Jakimowicz gave a few interviews, claiming that the coal they found is of very high calorific value (7,000 kcal), which was rather surprising, since LW Bogdanka’s coal is known for its poor quality. To show how serious they are, the Australians decided to gather around some serious coal mining platoon of advisors. Former CEO of LW Bogdanka (and later of KW) Mirosław Taras became a company’s consultant. Henryk J. Jezierski was appointed for a member of Supervisory Board, after four years of taking a position of Head National Geologist (before that he was working for 14 years as a Director in Geology and Mining Licenses Department in Ministry of Environment). In 2012 PD Co received 4 licenses for exploration the new deposits in LZW. Building new mine was planned for 2016 and would require approximately 3 billion PLN of investments. The first tonne of coal was expected to leave new facility around 2021-2022. According to the latest analysis, the whole area has a potential of 333 million tonnes of coal which would allow the company to run its operations for 45-50 years, with 2,000 employees. Unofficially, some experts were very skeptical towards the Australian involvement in mining in the area. Off the record, they revealed that PD Co made a series of offers to LW Bogdanka for selling the whole project and that it was their true intention from the very beginning. Polish producer was not interested though, because the area called Lublin Coal Project was too wide for them and they were interested only in part of it – deposits labeled as K6 and K7. Two months ago the market found out about a struggle between LW Bogdanka and the Australians over K6 and K7 deposits. It seems like LWB was tired of negotiations with PD Co and decided to take over these deposits on the legal path, by applying for a mining license on this area. If eventually LWB would win that fight, this would be a disaster for PD Co. Either they would really like to start mining operations in 6-7 years (recently the company announced that they were backed with financial support of 85 million PLN from British CD Capital Natural Resources Fund) or they were just trying to dispose quickly an inflated balloon, so far PD Co invested more than a 50 million PLN in the Lublin Coal Project and that money has to go back to their pocket. Two weeks ago Artur Kluczny, vice-chairman of the PD Co Management Board announced, that the company is about to enter the Warsaw Stock Exchange by the end of August. Some commentators speculate, that the whole story with establishing the real mining activities is only a backup story to pump the stocks. 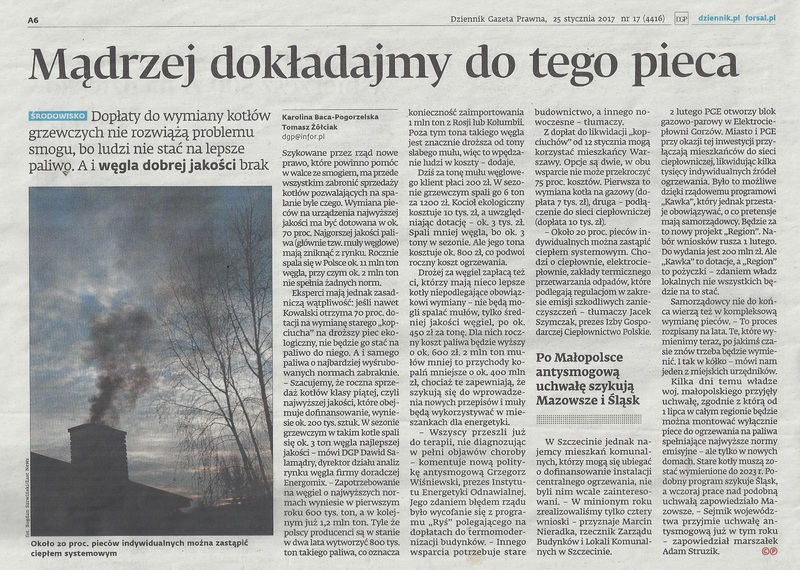 PART 2 OF THE STORY ABOUT AUSTRALIAN INVOLVEMENT IN HARD COAL MINING IN POLAND COMING NEXT WEEK.